Richard Elliot had the great fortune to start his career during a period, when people still estimated music by supporting the artists with their purchase of new albums. After his work as member of the group Tower of Power he released his solo debut Trolltown (1986). The smooth jazz format was flourishing and Richard could release a new album nearly every year. Initial Approach (1987), Power of Suggestion (1988), Take to the Skies (1989), What's Inside (1990), On the Town (1991), Soul Embrace (1993), After Dark (1994), City Speak (1996), Jumpin' Off (1997), Chill Factor (1999), The Best of Richard Elliot (2000), Ballads (2001), Crush (2001), Ricochet (2003), Forever, For Always, For Luther (compilation with various artists) (2004), Metro Blue (2005), R n R (with Rick Braun) (2007), Rock Steady (2009) and this year In the Zone followed. Like many other artists Richard is returning to his past values and pays homage to the time of R&B and jazz he grew up with. Elliot's associates Nate Phillips (bass), Tony Moore and Lil’ John Roberts (drums), Dwight Sills and Michael Thompson (guitar), and percussionist Lenny Castro are among the artists on the new album. Most songs were written by Richard and Jeff Lorber, who also participated on this album as keyboardist. Come on board entering the luxury travel to the tropical Island Style. There are only a handful saxophonists worldwide who manage this perfect and elegant flow. Boom Town offers a heavy guitar loop by Dwight Sills elevating the song to one of smooth jazz radios' darling. Metropolis was originally the title of a film by Fritz Lang (1927). In the broader sense it's the synonym for a mega-city. Elliot delivers the vibrant soundtrack for the big city life. Marvin Gayes' Inner City Blues (Makes Me Wanna Holler) hasn't lost his social significance. Written in a time of economic trouble the song returns with a message for the underpriviledeged people. Take your unfortunate situation not as god-given. Thanks to Richard for this furious reminder. Most agreeable is Richard's return to the straight-forward melodious performance on The Lower Road. No overdub and studio technical finesse, just pure melody. Bring It! is certainly Jeff Lorber's take, undisputable his funky style. On the other side David Mann's fine horn arrangements as on Just A Taste have also a great dose of attractiveness. When you mixed Funk and Richard Elliot, what is the essence? Da funky In The Zone! Dwight Sills and Jeff Lorber stir up the fire on guitars and Richards burns on sax. Get rid of the Porsche, ride Richard's Panamera. Golden Triangle is an area that overlaps the mountains of four countries of Southeast Asia: Burma, Vietnam, Laos, and Thailand. Richard's melancholic piece exudes a peacefulness and tranquility as it explores the beauty of this region. 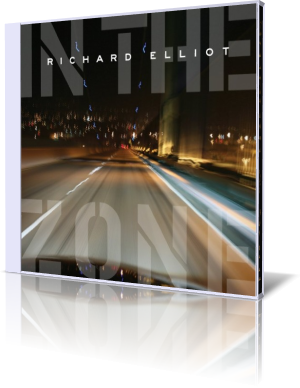 With In The Zone Richard Elliot garners anew the Triple A of smooth jazz. Eclectic music with a well-crafted musicianship on every track that attracts all music lovers.